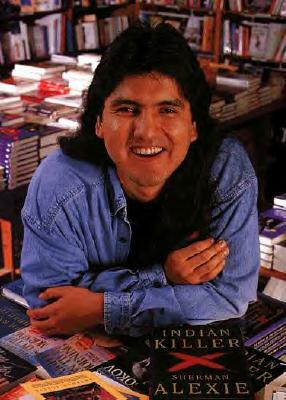 Sherman Alexie’s work is many things – adjectives like “funny,” “self-absorbed,” “romantic,” “mournful,” “downright tragic” spring to mind. Most of all, though, it is angry. Consider “Indian Education,” one of the more non-essential (if we’re being honest) stories in his otherwise wholly essential The Lone Ranger And Tonto Fist Fight In Heaven collection. The story is split into sections, one for each grade in school. And almost without fail, each section is full of fight, full of anger and sadness. We have arguments with teachers, fights between students, lost basketball games, suicides, alcoholics, jealous neighbors, identity crises. Plenty of blame and no solutions. There are no sappy memories here of happy times. This is a condensed diary of a childhood in turmoil. And that’s quite a trick on Alexie’s part. As I circulated the original print around the classroom, Mrs. Schluter intercepted and confiscated my art. Censorship, I might cry now. Freedom of expression, I would write in editorials to the tribal newspaper. In third grade, though, I stood alone in the corner, faced the wall, and waited for the punishment to end. Loved this! Thanks for sharing! I’ve seen Alexie speak and really enjoyed your post! If you’re ever interested in some great book reviews and musings, be sure to follow! Thanks!! !